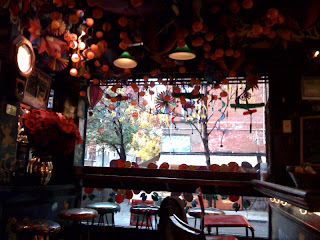 When we first walked into Cubby Hole in the West Village almost eight months ago, we didn't know it was a lesbian bar. Cubby Hole caught our eye because it looked festive inside, with hundreds of tiny pumpkin decorations hanging from the bar's ceilings; it was October after all when we took this photo. Sure, Cubby Hole (on West 12th & West 4th Street) is known as a lesbian bar, which we figured out in about two minutes sitting there. But for most people that live in this area, it's also just a great neighborhood hangout bar. The bar's vibe is friendly, relaxed and casual (although we have a feeling it gets pretty crazy late night weekends). The bar itself is small and cozy, so you know why the bar is named what it is. The bar is decorated with toy airplanes, lanterns, large goldfish, and they change the ceiling decorations with the changing seasons and holidays. It seems almost absurd that ceiling decorations can add to the appeal of a bar, but in this case it really does. Somehow Cubby Hole manages to look classy and fun without feeling tacky, cheesy or downright mardi gras. This is the kind of bar where you'll find a mix of people - straight, gay, old, young, rich, poor. Another great thing about Cubby Hole - they have a 200,00-song jukebox. When we went, Stevie Nicks and George Michael were on heavy rotation. Aint nothing wrong with that.